G13 Labs has begun developing cannabis seeds in 1980 in the north of England. With a number of specialized experts they have given G13 Labs strains her quality. They deliver feminized and autoflower seeds with strong genetics. Many of the G13 Labs cannabis seeds strains are suitable for both, an indoor and an outdoor grow. Auto Berry from G13 Labs is a feminised autoflower cannabis strain which is very popular and famous. These cannabis plants are suitable for an indoor and outdoor grow. They remain reasonably small and therefore they are also suitable for example a balcony. Blue OG from G13 Labs is a feminised cannabis strain which produces a high yield of cannabis. This cannabis strain is suitable for an indoor and outdoor grow. This cannabis plant contains mainly Indica genetics and descends from a nice crossing. Blue Venom from G13 Labs are feminised cannabis seeds which contain Indica genetics. These cannabis plants could become very large during the flowering period. This cannabis strain is easy to grow and has a slightly spicy taste. Blueberry Gum from G13 Labs are feminised cannabis seeds that are very mildew resistant and suitable for the starting grower. These cannabis plants generate a high quality cannabis and the effect of smoking this cannabis is a pleasant and relaxed feeling. Blueberry Gum #2 from G13 Labs are feminised cannabis seeds which have a relaxed and powerful effect. You could grow them both inside as outside and they are also suitable for a SOG grow. Cheese from G13 Labs are feminised cannabis seeds which are suitable for the starting grower. These cannabis plants generate a good quality weed. This cannabis has a clearly recognizable cheese taste and the effect of this cannabis is a long-lasting happy feeling. Chocolate Heaven from G13 Labs are feminised cannabis seeds which are very easy to grow. She generates a delicious strong fruity chocolate smell during the flowering. You could cultivate these plants both inside as outside. Cinderella 99 from G13 Labs is a feminised cannabis strain which contains mainly Sativa genetics. She is suitable for an indoor and outdoor grow and has a very special and delicious taste. She is originated by crossing very famous parents. Sweet Amnesia from G13 Labs is a cannabis plant that has a good resistance against mildew and she could also resist colder climates. Therefore she is very suitable for an outdoor grow. This cannabis plant could produce a very high yield. Double Black from G13 Labs are feminised cannabis seeds which contain mainly Indica genetics. It is easy to cultivate this cannabis plant and this strain is suitable for an indoor grow and an outdoor grow. Gigabud from G13 Labs are cannabis plants that remain relatively small but produce nevertheless nice large buds. This cannabis strain is easy to cultivate and resistant against mildew. The effect of smoking this cannabis is a long-lasting powerful effect. Hypnotic from G13 Labs are feminised cannabis seeds that are suitable for an indoor and outdoor grow. These cannabis plants don’t become very large and they are suitable for all kinds of culturing. This strain could be used as Medical Marijuana. Lemon Amber Kush van G13 Labs is een zeer makkelijk te kweken plant die ook makkelijk te oogsten is. Ze heeft een heerlijke en krachtige zoete smaak. Ze is ontstaan uit Amerikaanse genetica. Midnight Kush from G13 Labs is a cannabis strain which could become large under the right circumstances. She is suitable for an indoor and outdoor grow and she is resistant against mildew. This cannabis has a very powerful effect and a fresh and fruity taste. NL Automatic from G13 Labs are autoflower cannabis seeds which are very famous. This cannabis strain is easy to grow and remains pretty low during the flowering. The effect of this cannabis is a powerful stoned feeling. Northern Light X Skunk from G13 Labs are feminised cannabis seeds that are very popular among skunk lovers. This cannabis strain is easy to grow and generates a high yield. This tasteful cannabis has a high content of THC. OG13 from G13 Labs is a strain which contains genetics from the most famous kush strain in the world. These feminised cannabis seeds generate cannabis plants which produce compact and hard buds. This cannabis could be used as Medical Cannabis. 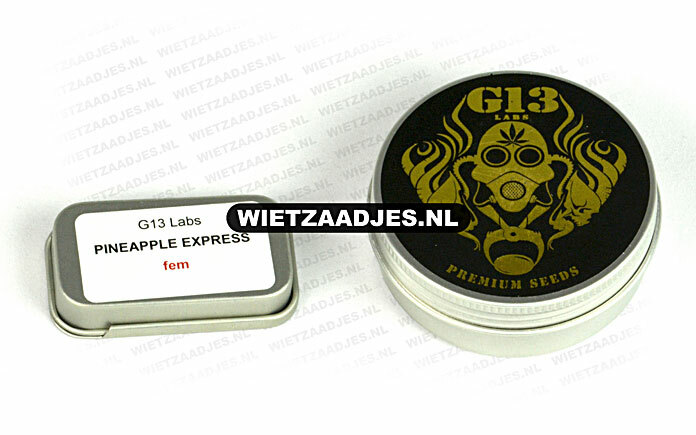 Peach Puree CBD van G13 Labs is een feminised wietzaden soort die zeer eenvoudig te kweken is zowel binnen als buiten. Deze CBD rijke wietsoort is sativa dominant en wordt ook als medicinale cannabis gebruikt. Het effect van deze wiet is mild. Pineapple Express from G13 Labs are feminised cannabis seeds that are suitable for an indoor and outdoor grow. This cannabis has a pretty high content of THC and the effect of this cannabis is balanced mental and physical feeling, without being lethargic. Pineapple Express #2 from G13 Labs are feminised cannabis seeds which contain mainly Indica genetics. These cannabis plants are suitable for an indoor and outdoor grow. This strain has a delicious sour taste and a good resistance against mildew and bud rot. Pineapple Express Auto from G13 Labs are autoflower cannabis seeds which receive good reviews. After a fairly short flowering time you receive a delicious fruity cannabis with a powerful effect. Purple Haze from G13 Labs is a feminised cannabis strain which contains mainly Sativa genetics. During the flowering period she produces nice purple compact buds. This cannabis has a spicy haze taste and smell. Raw Diesel from G13 Labs are powerful feminised cannabis seeds which are easy to grow and suitable for an indoor and outdoor grow. During the smoke this cannabis has a clearly diesel taste. Royal Kush from G13 Labs is a popular cannabis strain which has a pretty short flowering time and she is easy to cultivate. These seeds are appropriate for an indoor and outdoor grow. The effect of smoking this cannabis is a mental and physical powerful feeling and therefore not suitable if you want to have an active evening. Skunk #1 from G13 Labs is a stable cannabis strain that is easy to grow. This cannabis strain is suitable for an indoor and outdoor grow. The effect of smoking this delicious sweet cannabis is a very present mental feeling. Super Skunk from G13 Labs are feminised cannabis seeds that are easy to grow. This popular cannabis strain has a very short flowering time and produces a delicious powerful skunk strain. Sweet Amnesia from G13 Labs are feminised cannabis seeds which are reasonably easy to grow. This cannabis contains mainly Sativa genetics and is suitable for an indoor and outdoor grow. During the smoke she has a tasty light spicy sour taste. White Critical from G13 Labs is a feminised cannabis strain which is originated by crossing very famous cannabis strains. This cannabis plant is easy to grow and suitable for an indoor and outdoor grow. White Lavender from G13 Labs is a feminised cannabis strain which is suitable for an indoor and outdoor grow. This cannabis has a high content of THC and a powerful and intense effect. She contains mainly Sativa genetics. White Widow from G13 Labs is one of the most famous feminised cannabis strains in the world. She is suitable for an indoor and outdoor grow and ideal for the starting grower. The effect of smoking this cannabis is a powerful feeling which is mainly tangible in your body. Het merk G13 Labs is een bekend merk die feminised en autoflower wietzaadjes levert. Ze verpakken hun zaden in pakjes van 5. Deze wietzaden kun je bij ons ook per stuk kopen, we verpakken deze zaden dan handmatig in vochtvrije 'microfuge tubes' met duidelijke labels. De verpakking van G13 Labs kan verschillen wanneer je kiest voor een ander aantal of andere soort dan dat op de afbeelding staat. G13 Labs biedt de volgende feminised soorten: Blue Venom, Blueberry Gum, Cheese, Gigabud, Hypnotic, Midnight Kush, Northern light X Skunk, Pineapple Express, Purple Haze, Raw Diesel, Royal Kush, Skunk #1, Sour AK, Super Skunk, White Widow. Van de autoflowering soorten biedt dit merk de soorten: NL Automatic auto, Pineapple express auto.